When the clouds cleared last night I thought I would grab some images of both Mars and Saturn. Both images were taken through a Celestron 11" telescope, a DBK21 camera and a 2x barlow. This image is a stack of 4 automatic exposures using a Pentax K-x DSLR at the prime focus of a Skymax 127 Maksutov Cassegrain telescope. Clouds prevented the capture of more than 5 images of M42/3 this evening. The Pentax K-x DSLR that I am testing was set to an ISO value of 12800 and 4s exposures. It was placed at the prime focus of an f/4.8 10" Newtonian with a light pollution filter in place. There was no post capture noise reduction taking place, so an image was available immediately the exposure was completed. The camera will be very thoroughly tested, but is is proving to be very promising as an astronomical imager. I am testing a Pentax K-x DSLR as a possible general purpose camera for astronomical imaging as well as general photography. Pentax cameras are not commonly used for astronomical imaging. However, the K-x has ISO settings up to 12800. This image was derived from 10 x 30s exposures taken through a 130mm f/5 Newtonian. The images were stacked in Registax after being reduced in size. 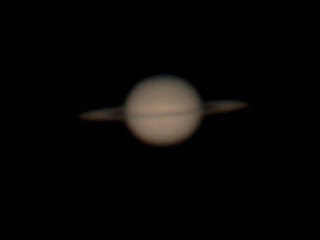 The camera was fitted with a light-pollution filter and the lens assembly from a x2 Barlow lens.